Here in Seattle it's universally understood that summer doesn't unofficially begin until after the Fourth of July. Until then, the weather makes no guarantees. I don't know if I can wait that long for a nice, sunny day. Seattle recently broke a 122-year-old record for the rainiest winter. I'm ready to get out of the rain. Fortunately I will making a trip to San Diego soon. There I know I'm guaranteed some sun. I'm also guaranteed a San Diego Padres game. This will mark the sixth different major league stadium (four if you exclude defunct stadiums) I have visited. I'm excited. Finding a song to remind me of summer was hard. Way back in 2005 I remember trying to come up with songs/albums that reminded me of each season and I could never come up with anything for summer. The song I picked doesn't remind me of any specific for summer but the feeling it gives me is a hot summer evening, windows open, a cool breeze wavering in. Perhaps one of the reasons why this song, and really the album it's from, reminds of summer is that I first discovered the song in the summer. Back in high school I went to a LAN (Local Area Network) party at my friend's house. LAN parties were necessary in the days of dial-up internet. In order to play multiplayer games with each other on our computers, we needed to be in the same room on the same network. After we would play a few hours of Counter-Strike we would all download music and movies from each others' computers. Minus the Bear's Highly Refined Pirates was one such album I picked up as all the songs titles were unusual like "Monkey!!! Knife!!! Fight!!!" and "Thanks for the Killer Game of Crisco Twister." I became a big fan of the band for their next two albums Menos El Oso and Planet of Ice. I stopped tracking the band when their album Omni focused less on the technical, math rock and veered toward synthpop. Admittedly, I only listened to one song from Omni as wasn't the direction I was expecting or wanted. I love a good synthpop album but not when it's from one of your favorite bands who should not be making such an album. As I write this I decided to put on Omni to see if I can fairly judge it. Stay tuned. When I think about summertime, I often think about summer in New Hampshire growing up. The summers there were hot and humid. They were also a lot of fun. I had no school. I had no responsibilities. I could play all day. Simpler times. When I think about New Hampshire I also think about collecting Magic the Gathering cards. I don't recall how I became hooked on Magic; maybe because other kids at school were playing the game. At one point, you had to get special permission to play the game at school. 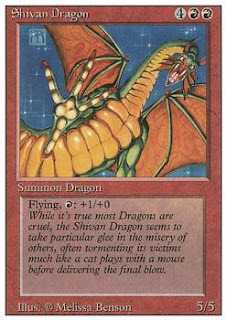 I also think Magic cards were banned at one time, too. I collected Magic cards during the time of the Revised/3rd Edition. One of the best birthdays I had was when my parents gave me a WHOLE box to open all by myself while everyone watched. Thank you Mom and Dad. I had so many cards that I decided to put together the whole set, which was the first time I tried to complete a set. I did complete the set but the cards have been lost to the universe. I even asked my dad if he knew where they were and he didn't know. I have some mana cards but that doesn't count. If they ever turn up I will be very happy. Until then, I'll live off the memories. I went to my first Mariners game of the year on Friday. The game turned out well with Felix Hernandez putting in a great effort and the bullpen held the slim lead that the offense gave them. A 2-1 victory is about right for any game that Felix pitches. The main highlight of the evening was the stadium giveaway. 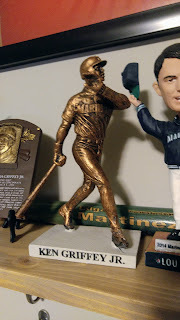 The day before the Mariners installed a statue of Ken Griffey Jr. After being inducted into the Hall of Fame this was inevitable as he is one of the most, if not the most, beloved players in Seattle history. On game night the Mariners gave out a replica of the statue, which features Griffey with his signature swing. Onto day 2 of the challenge! Coheed & Cambria are often compared to Rush both musically and lyrically. The lead singer of Coheed has a high falsetto voice much like Geddy Lee of Rush. Coheed doesn't lean too hard into prog-rock like Rush but Coheed is definitely inspired by the genre. Both singers wrote about the fantasy genre. Part of the appeal of Coheed was that each album was a concept album part of a larger story. I never followed the story to completion (if it even ever happened) as I dropped off from the band before that. Still, I can appreciate a band with a larger vision. "33" can either be interpreted as part of the overall Coheed story or it can be interpreted as a song about Patrick Ewing. The story I heard was that Claudio Sanchez (the lead singer) was at a Knicks game watching Patrick Ewing play from the upper level and was inspired to write a song about him. I'm willing to believe that the song is about Ewing. 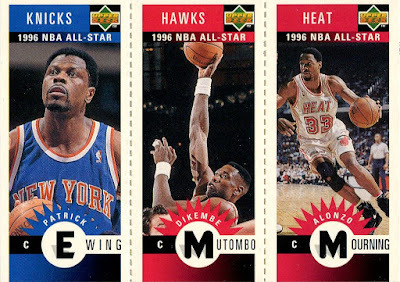 Ewing wore number 33. Lyrics include such phrases as "Patrick short flip and outside / boundary lines" as in he's throwing a pass to the out of bounds. Another lyric includes "well nothing looks right from up here / i'm still unclear about the things you might have said." Since Claudio was watching the game from high above in the arena, he could not make out what Ewing was saying on the court. No matter the true meaning, it's a fun theory. 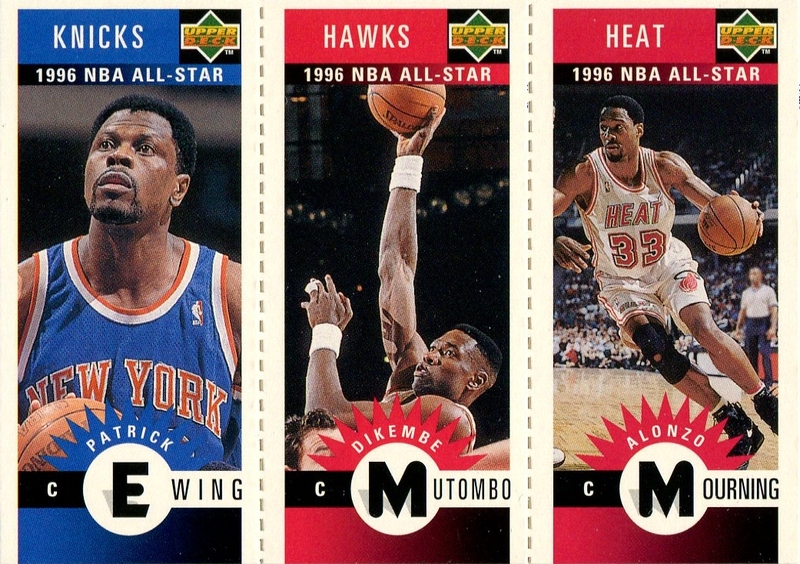 I could not pass up the opportunity to post a Patrick Ewing card after writing about a song that may or may not be about Patrick Ewing. I only have eight cards of his in my collection so it was a difficult choice to pick out which card I would feature. Actually, it was an easy choice, a Collector's Choice. The minis from Collector's Choice were always a treat to pull. The fact that this one features all elite players who are part of the Hall of Fame makes it even better now. I would not be opposed if this type of three-panel card made a small comeback. In baseball there seems to be some fatigue over true minis as neither Gypsy Queen nor Diamond Kings had minis this year. Although I could envision card companies seeing this type of card as too labor intensive (not to mention acquiring three separate photo rights) to reproduce a similar card noways. Before I get into the topic at hand I wanted to give a quick aside and say that the beginning to the Mariners baseball season has been soul crushing on a whole new level. High expectations going into the season and the roster looked good on paper. As it stands right now, the team is 2-7. If they don't start to creep back up to .500, it will be a long season. When Tony from Off Hiatus Baseball posted on Twitter about making a 30-Day Baseball Card Challenge to mirror the 30-Day Music Challenge he had been doing, I was excited to take part. Not only would it provide great blogging material but it would be a fun way to re-examine all my cards. I won't be limiting myself to only baseball since my collection spans all sports. Regardless, baseball will likely take up a lot of these posts. The music challenge piqued my interest as well. I decided to give myself some extra work and take on both challenges at the same time. As can be seen on Tony's blog, talking about music and cards makes for some interesting connections and discussions. As I've been planning out my 30 days, I've found some great links. Since I'm going the blogging route instead of posting these topics on Twitter, I'm going to spread the posts out every few days or so. Unlike most bands, the leading instrument here is the violin. Kishi Bashi manages to craft delightful pop. His solo performances are a treat as he does a wonderful job creating looping samples of his violin and vocals to replicate the experience of a full band. I've seen Kishi Bashi play only once but it was one of the most fun times I've had at a concert. With baseball season just right around the corner [I drafted this the weekend of opening day], there is nothing like the bright white of a brand new baseball. Fortunately, baseball fans were treated to some early, meaningful baseball this year. The World Baseball Classic took over in March and provided a lot of memorable moments. From USA Baseball winning it's first WBC title, to Adam Jones making a spectacular leaping catch at the wall, and to Jose Bautista making a dead-on throw to the plate. 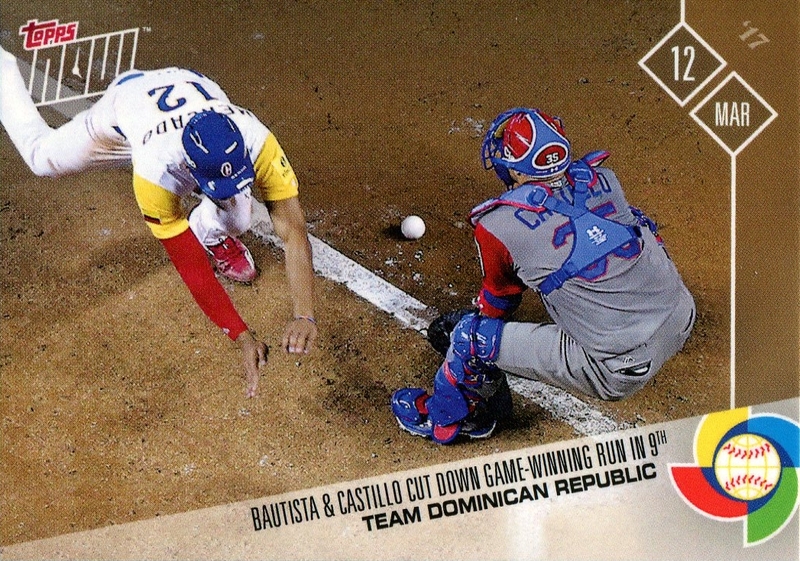 As the Topps Now card indicates, the throw to the plate eliminated a game-winning run to send the game into extra innings. The Dominican Republic would go on to win the game. The picture captures the moment perfectly. It's photos like these that I hope to see more of from Topps Now this year. [Two weeks into the season and Topps Now has been underwhelming]. That wraps up day 1 of the challenge. Like I said, I plan to put up a post on this topic every few days. Catch you next time!